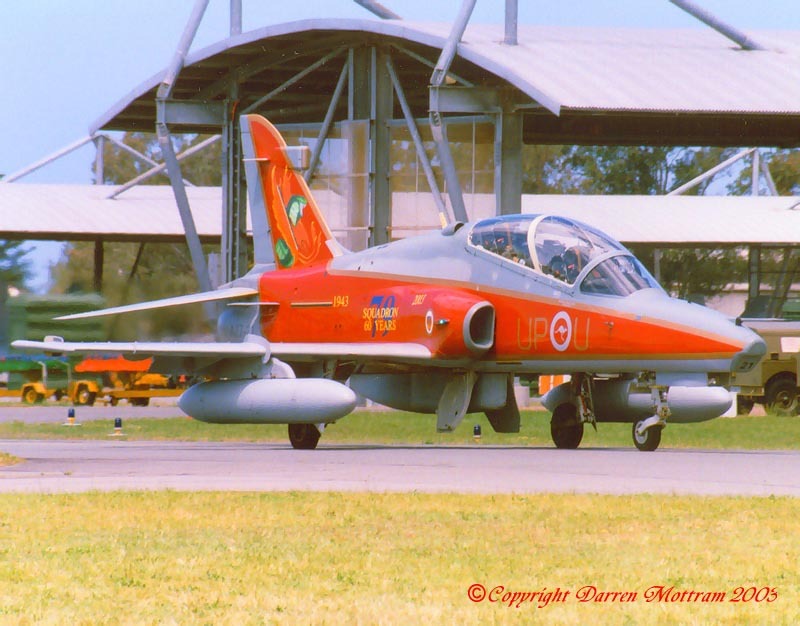 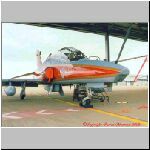 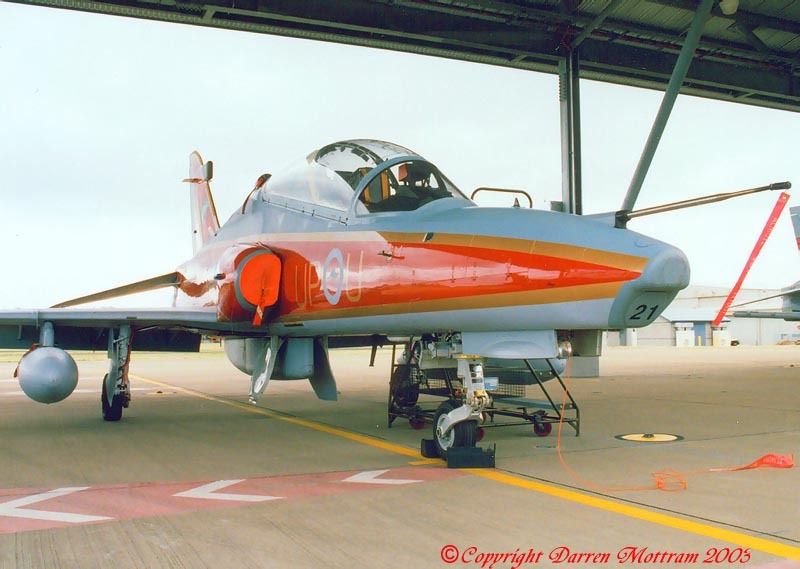 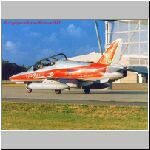 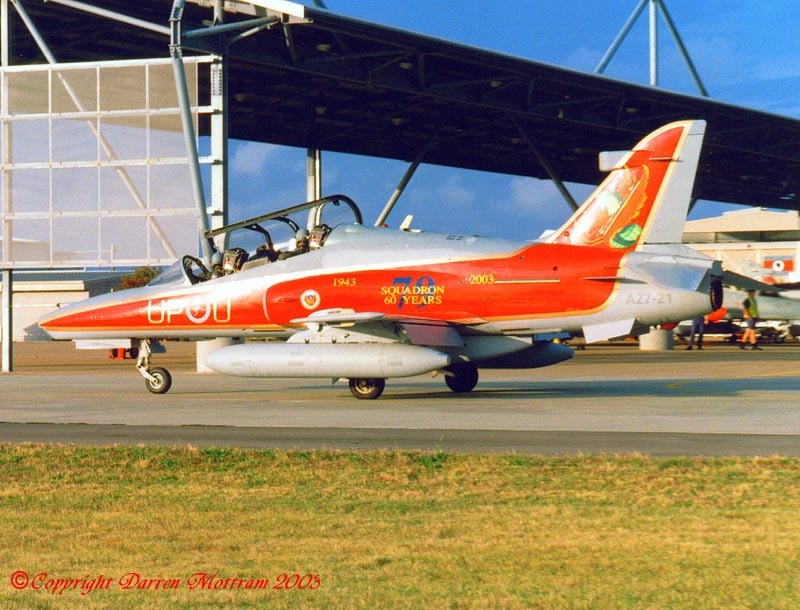 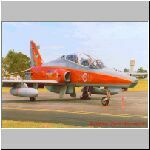 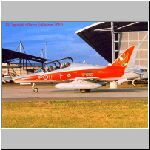 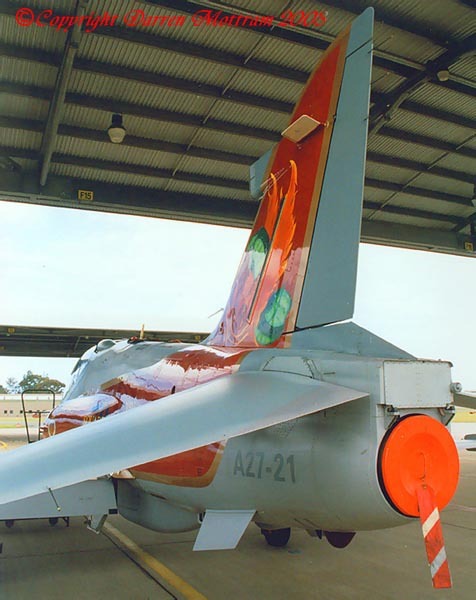 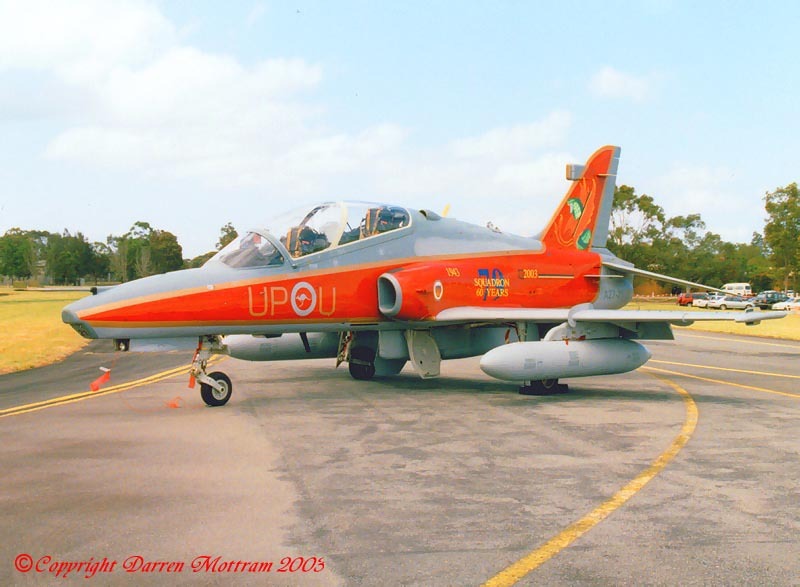 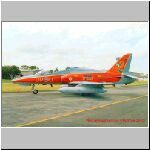 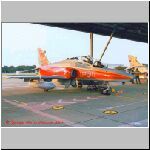 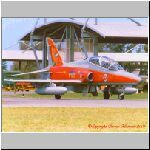 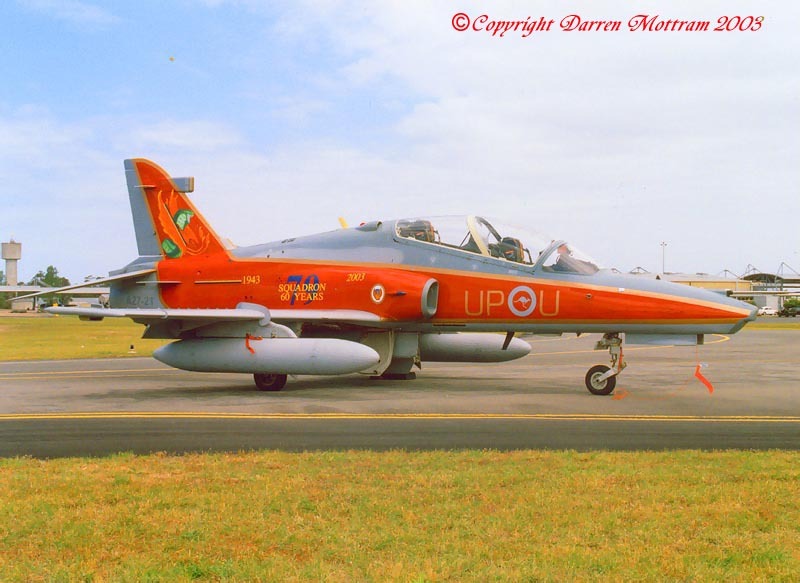 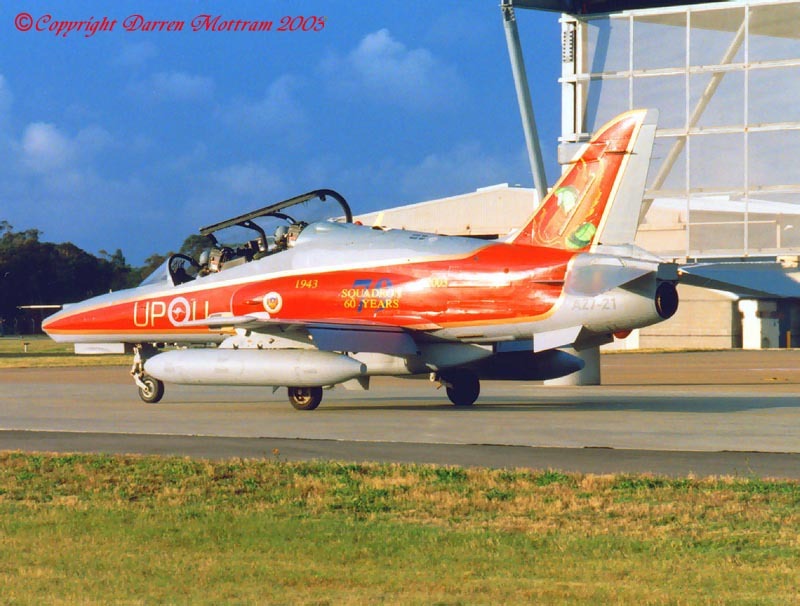 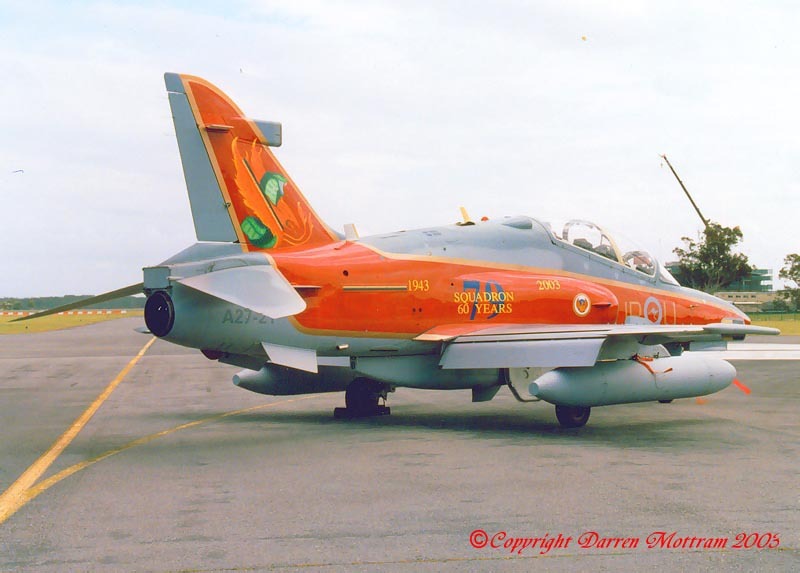 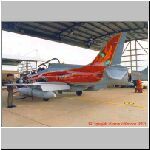 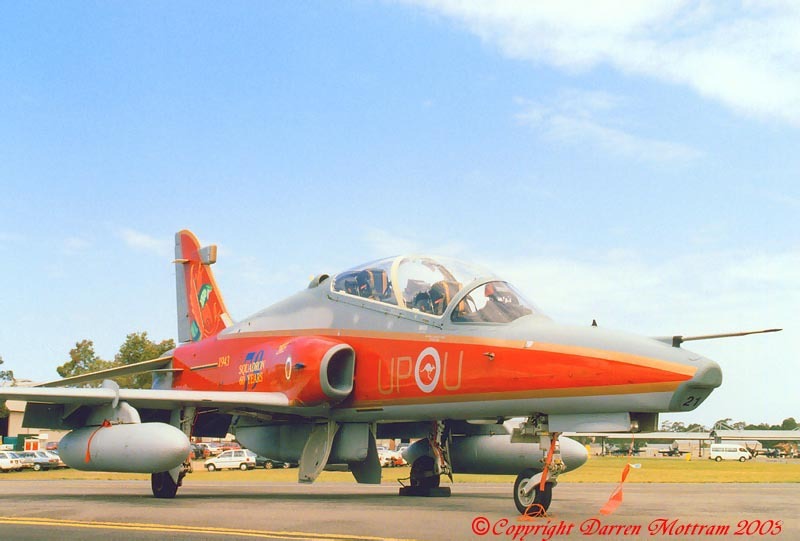 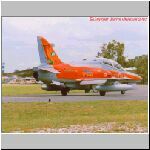 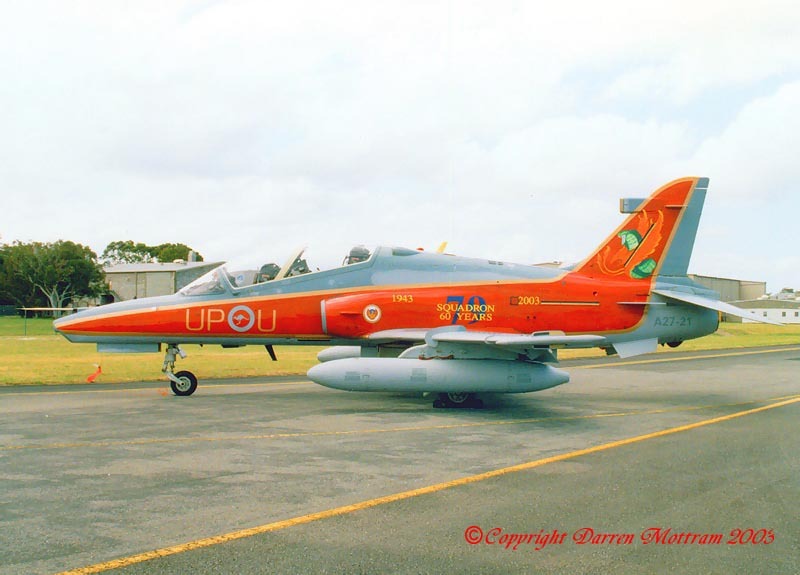 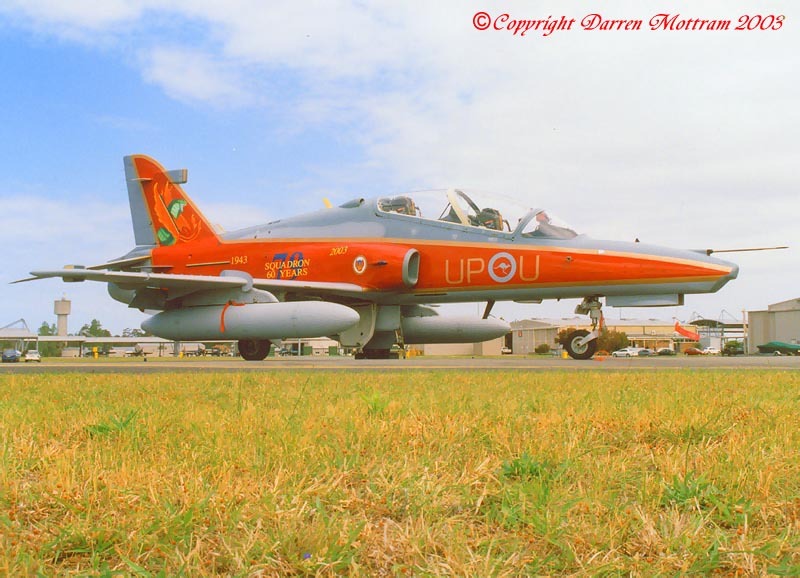 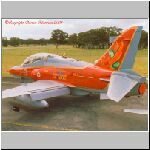 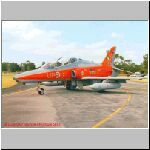 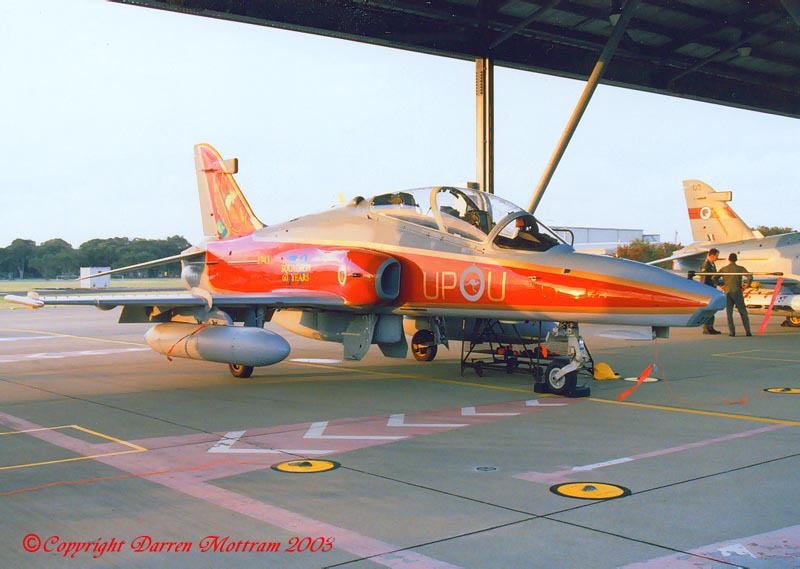 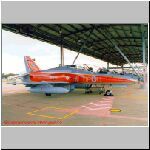 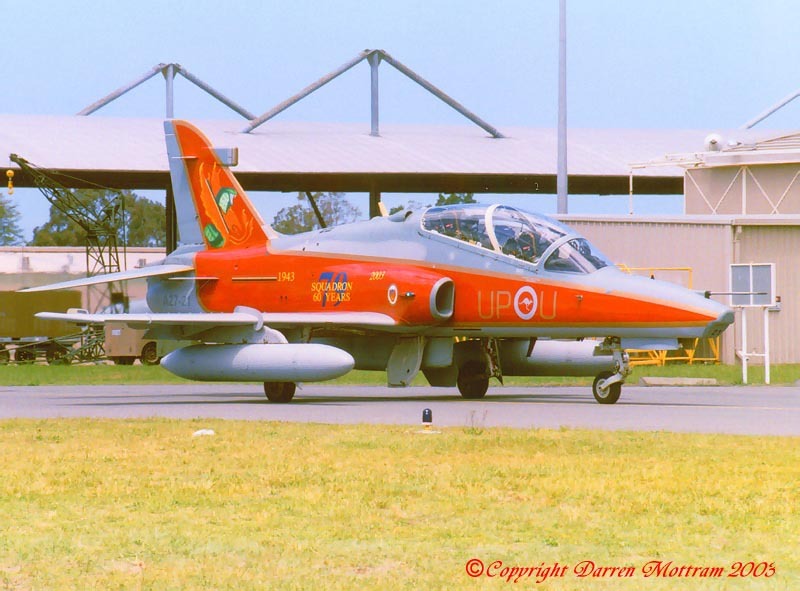 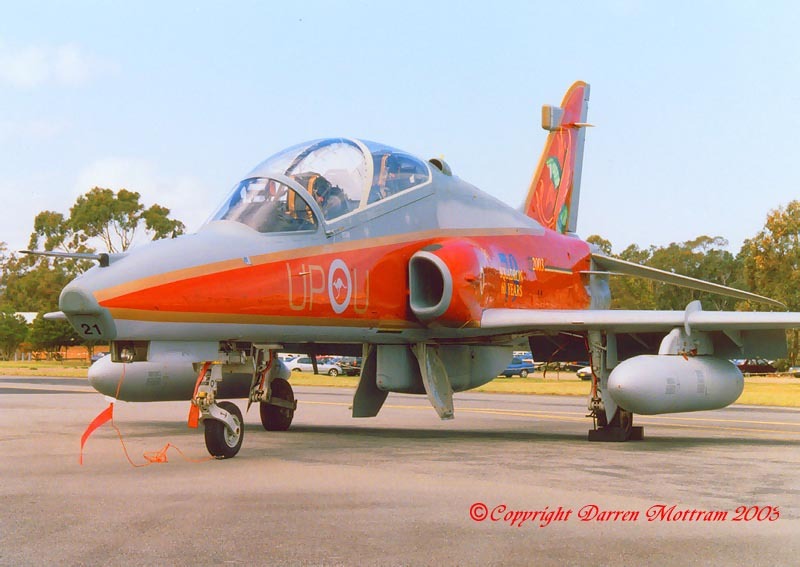 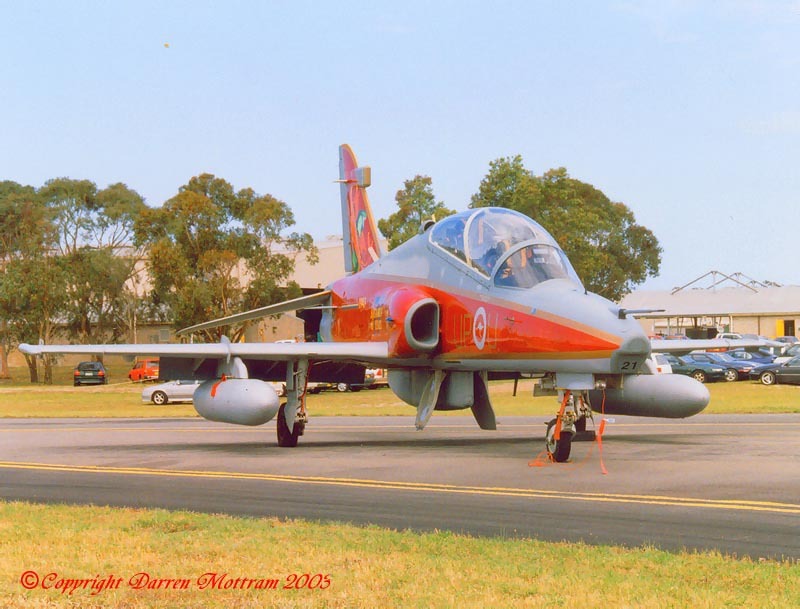 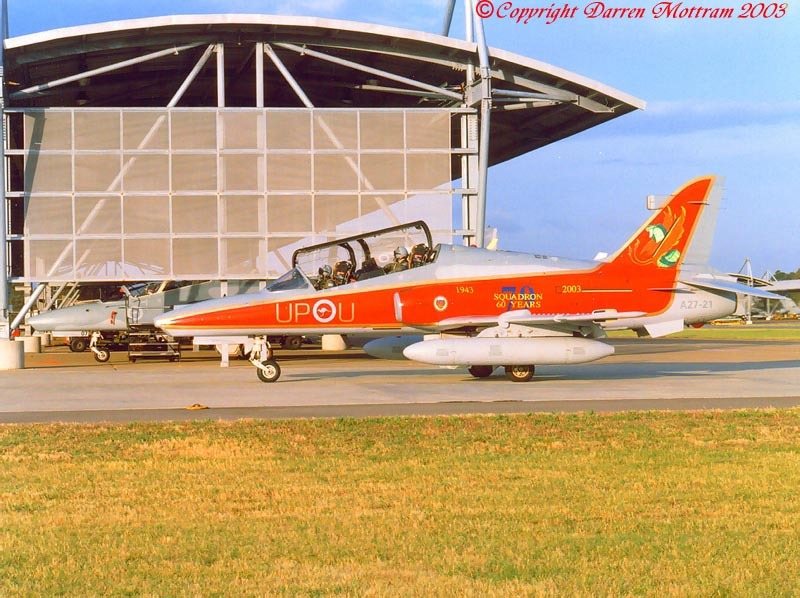 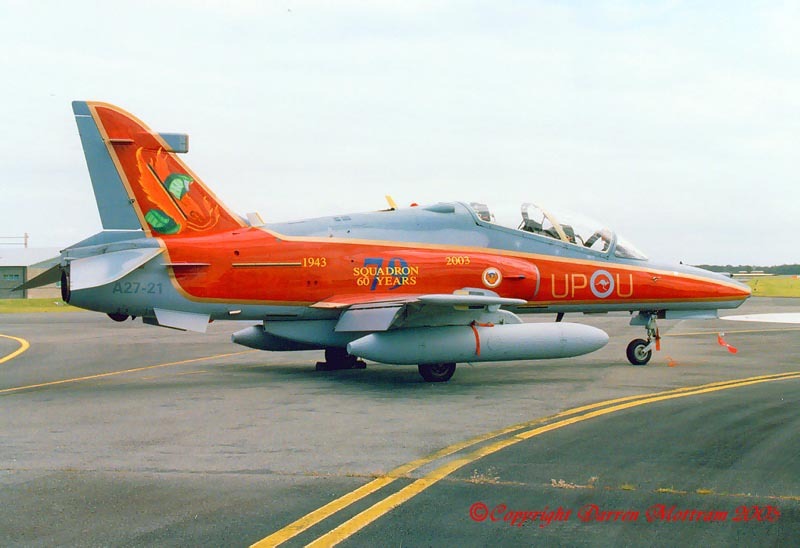 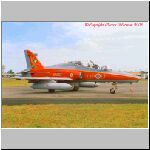 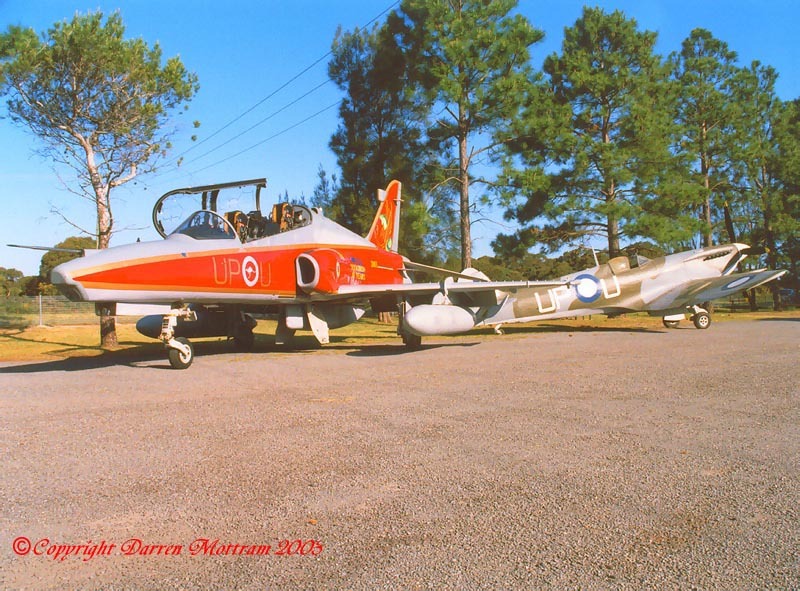 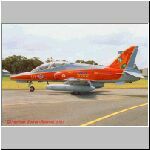 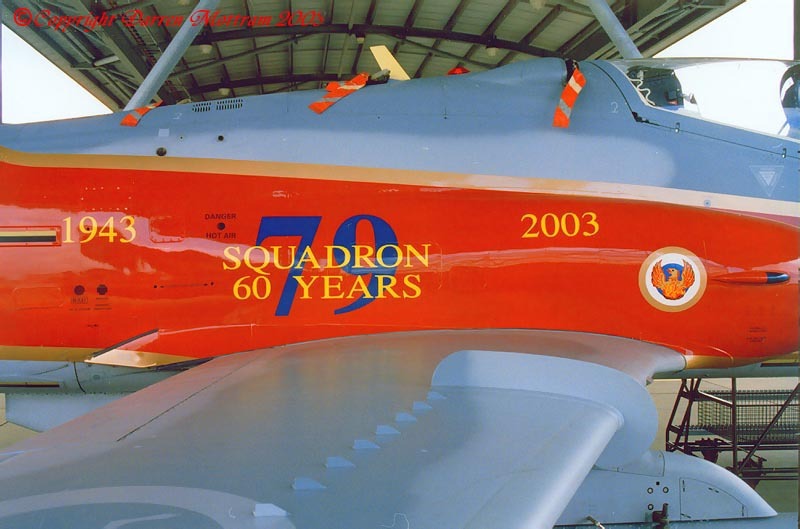 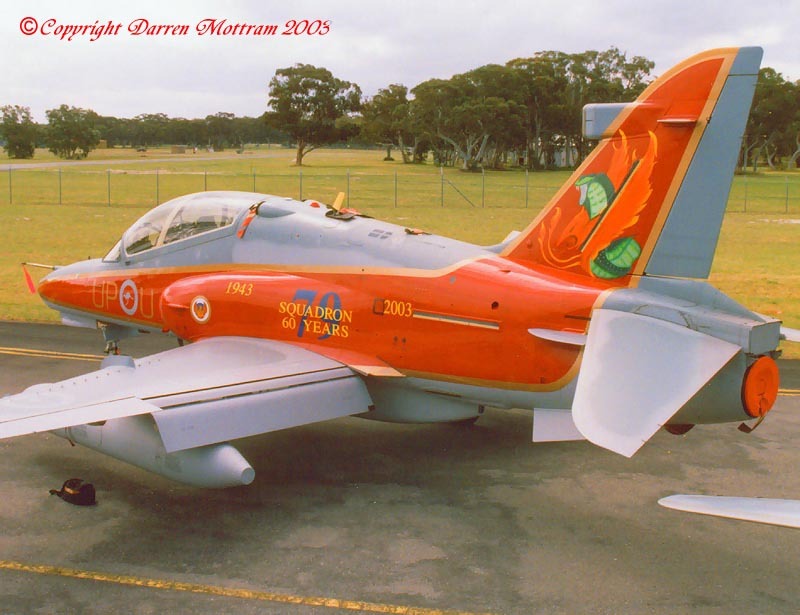 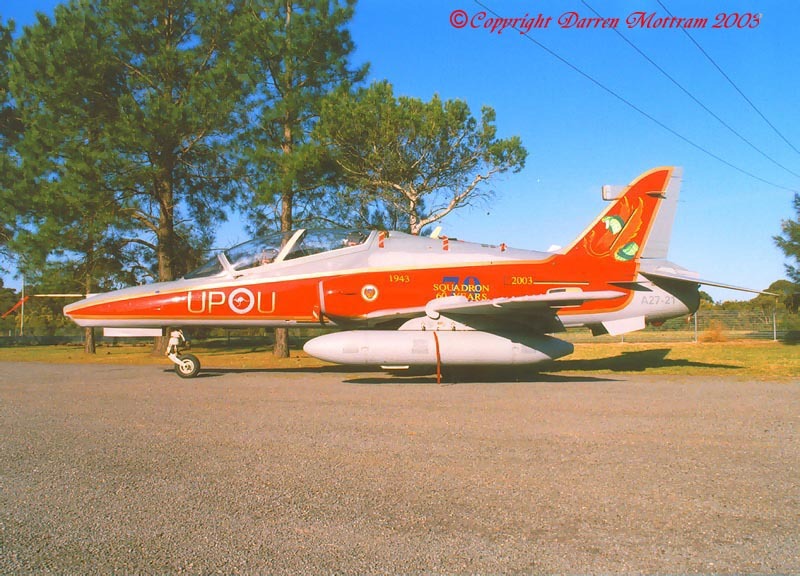 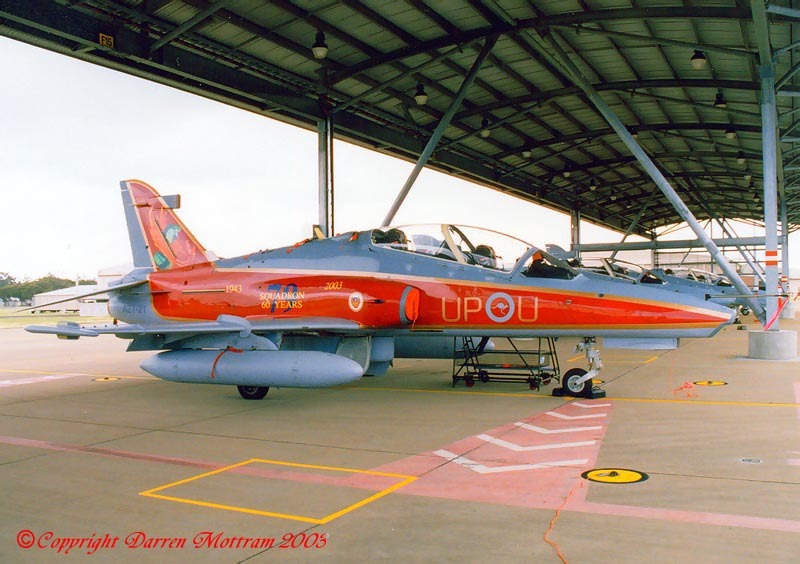 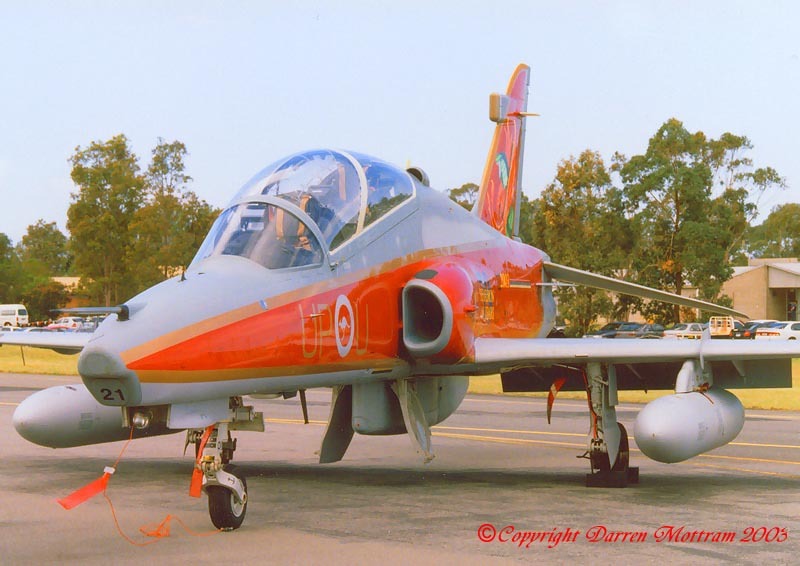 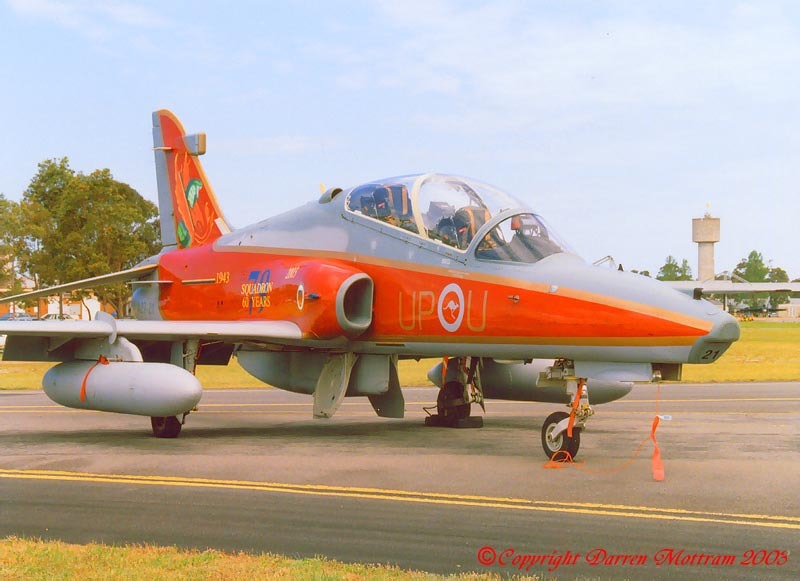 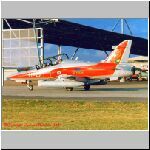 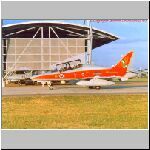 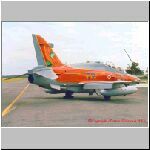 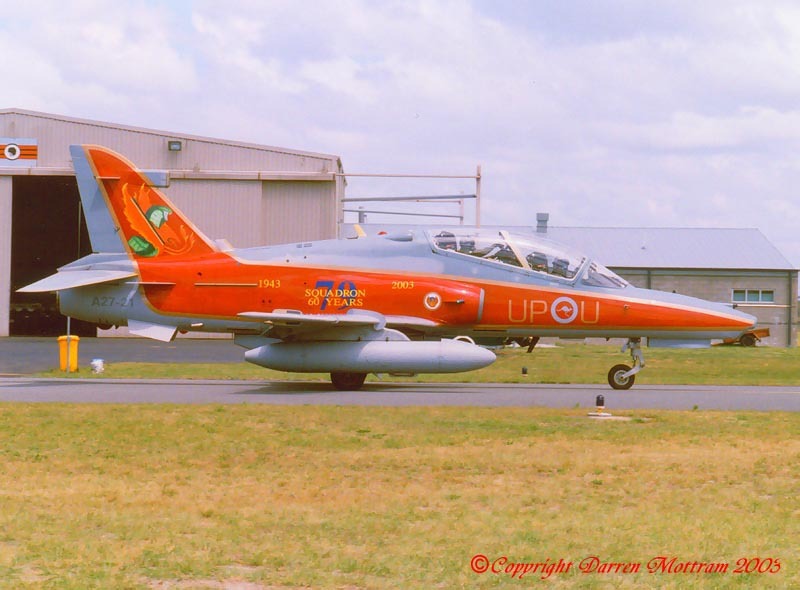 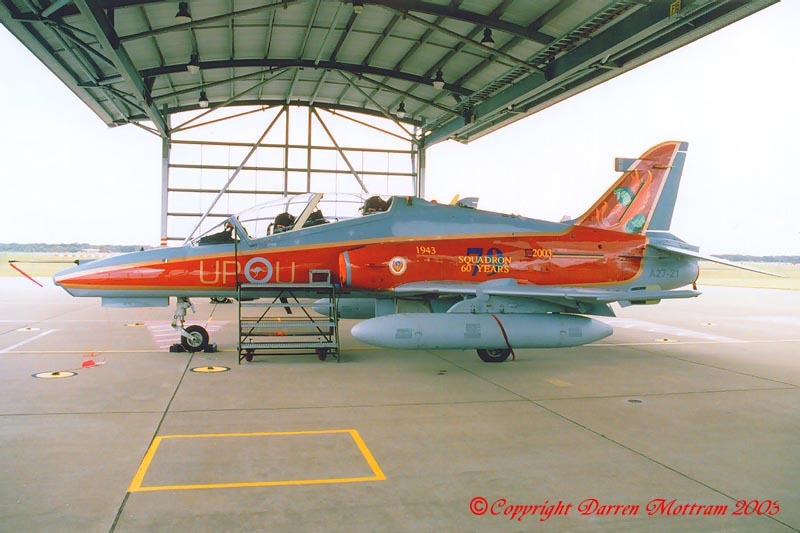 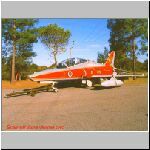 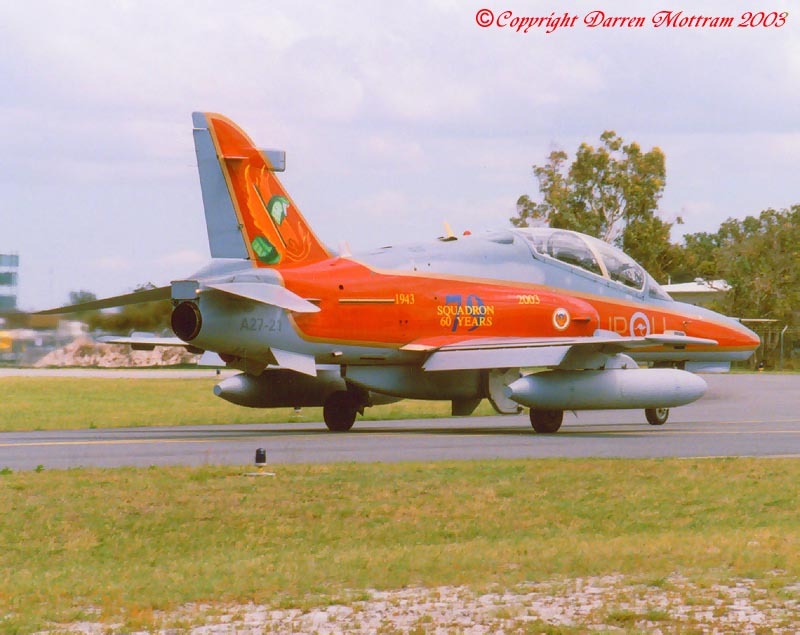 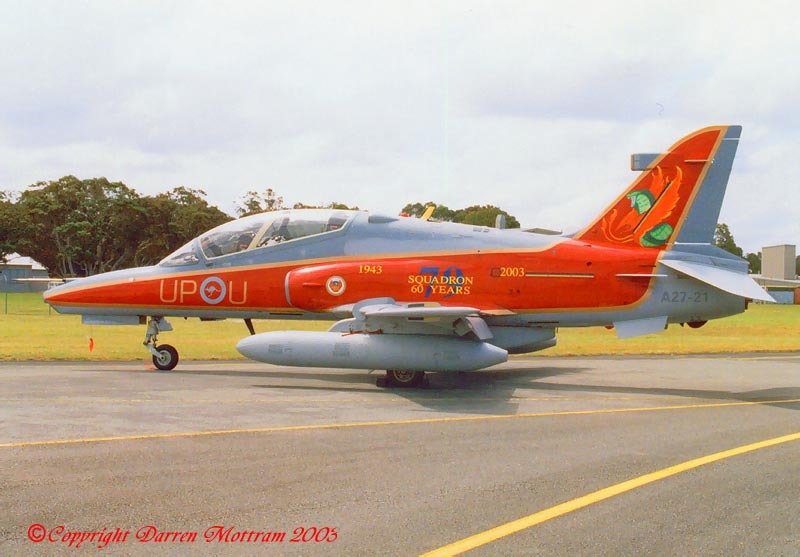 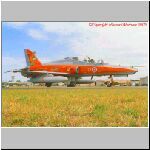 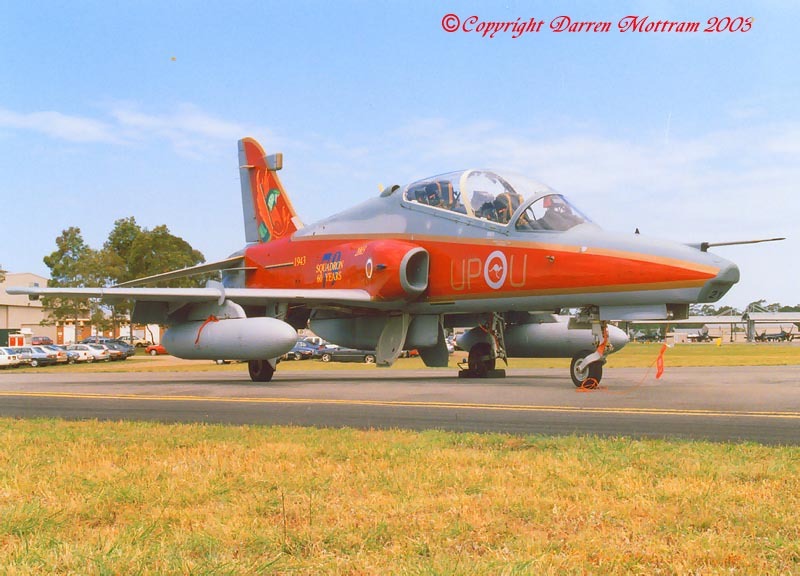 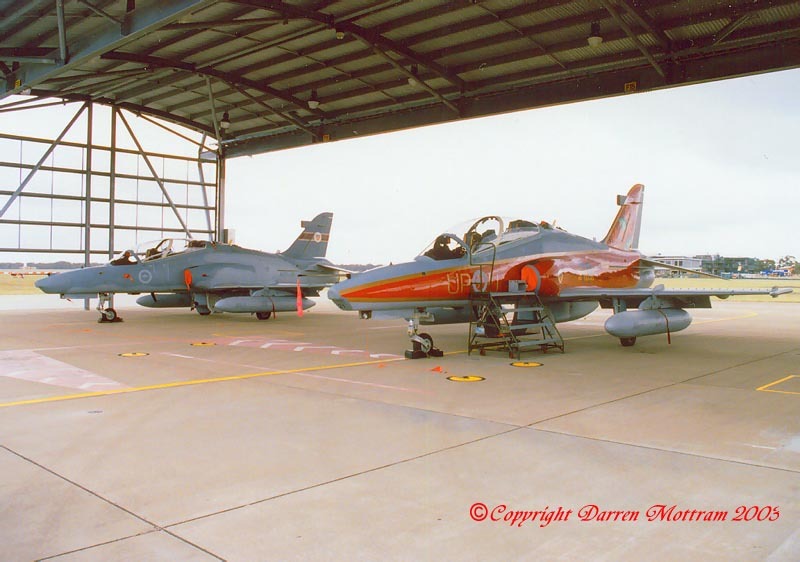 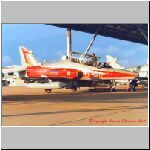 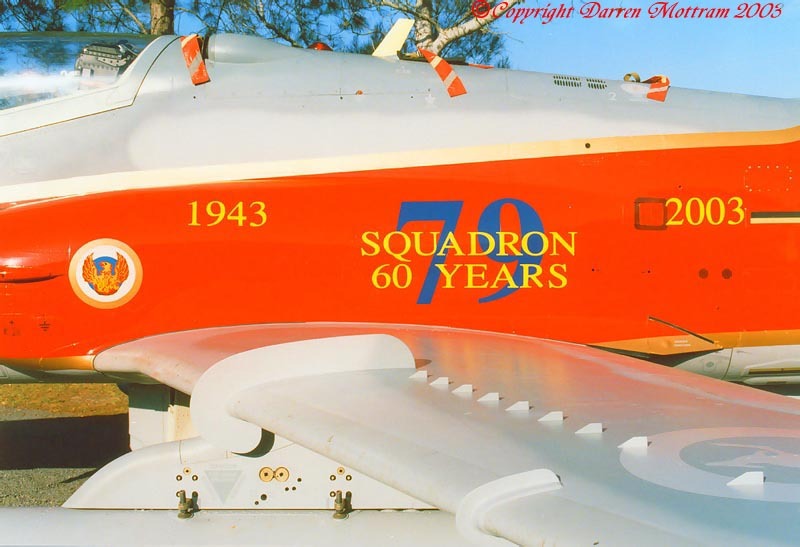 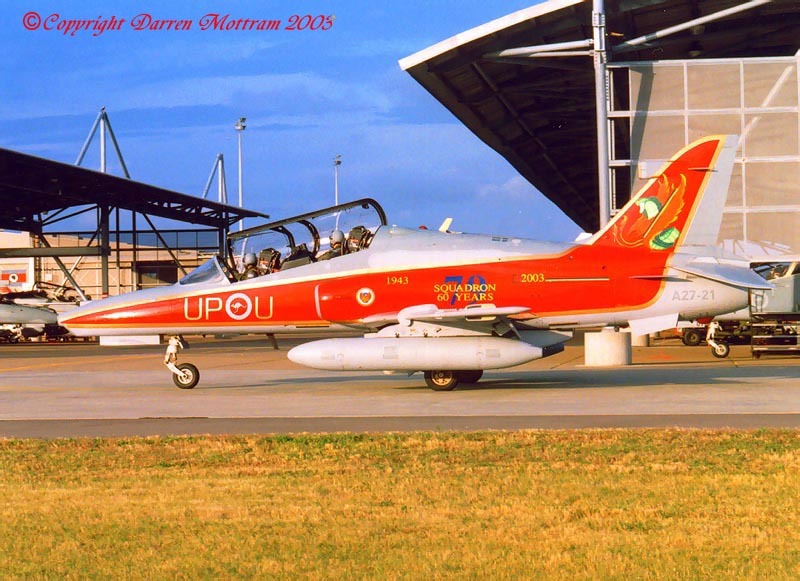 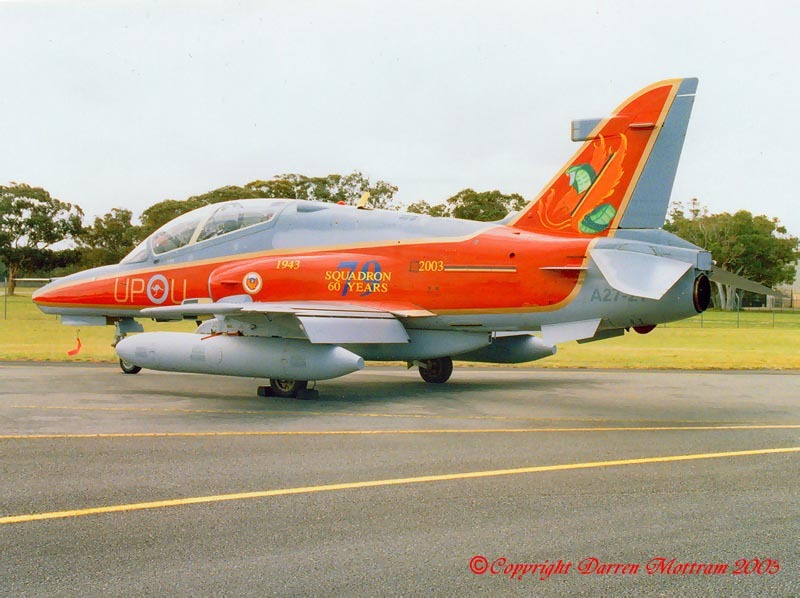 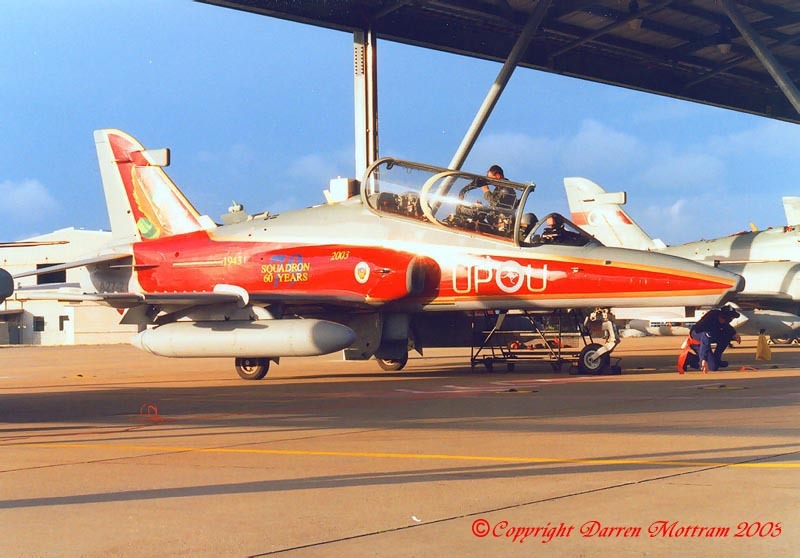 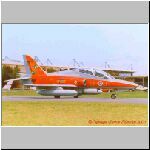 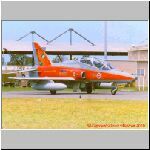 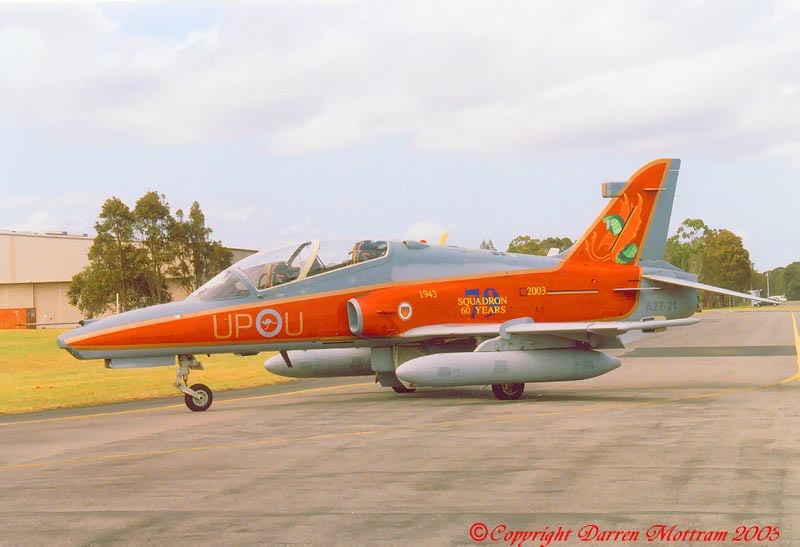 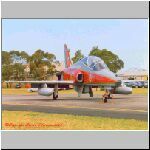 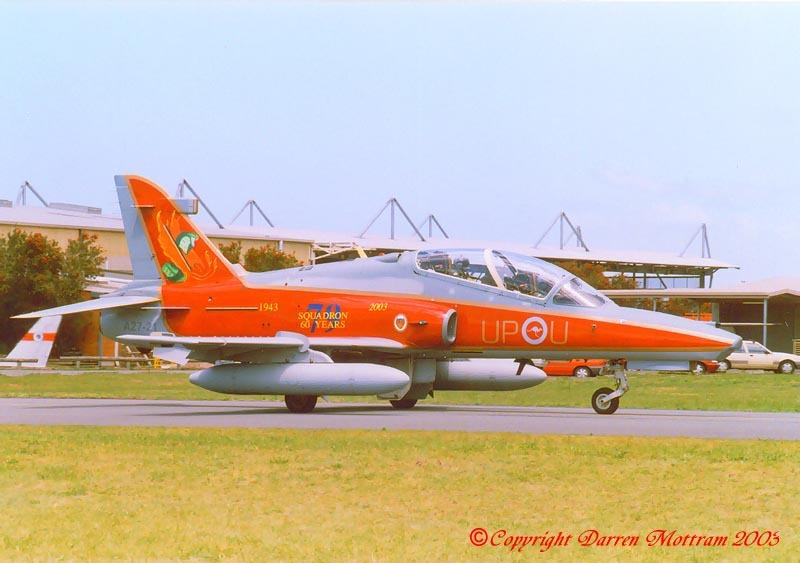 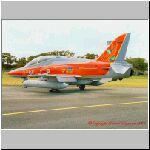 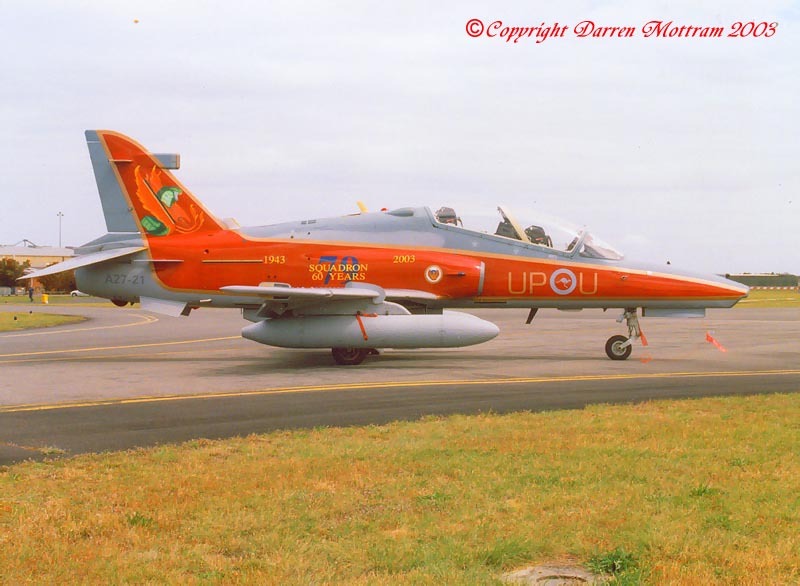 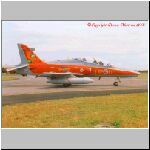 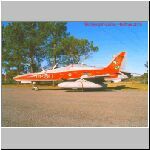 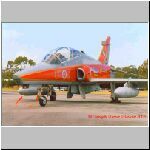 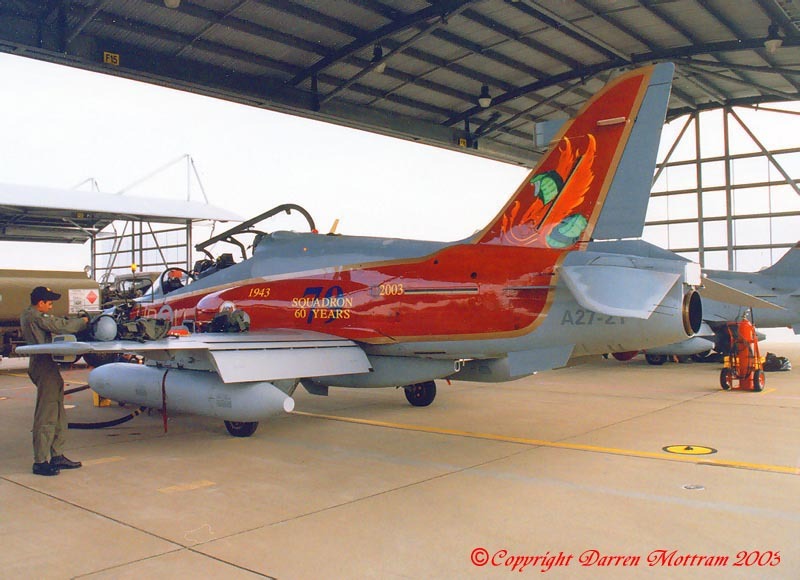 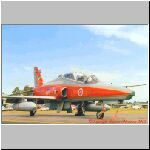 In 2003 79 Squadron took the opportunity to celebrate their 60th anniversary by applying a special paint scheme to BAE Hawk 127, A27-21. 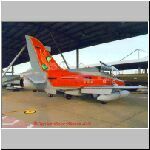 The scheme was designed by Jeremy Caesar and painted by Scott Miles and incorporates various elements from the unit's past. 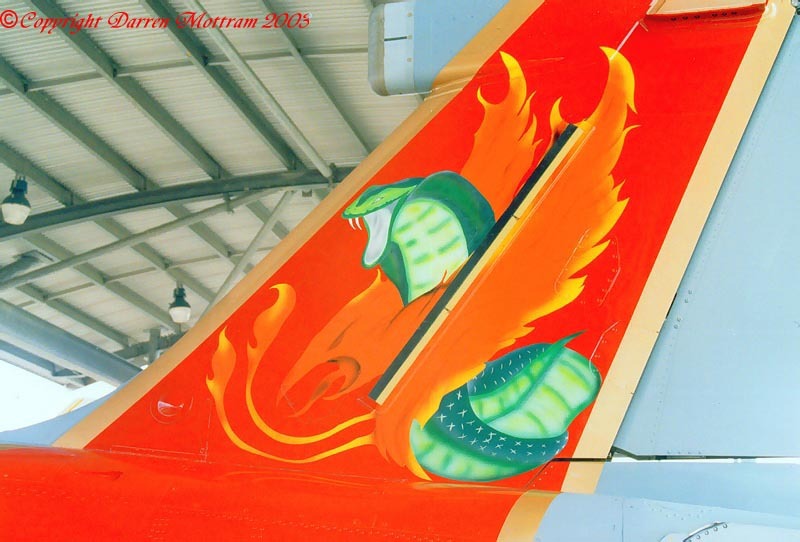 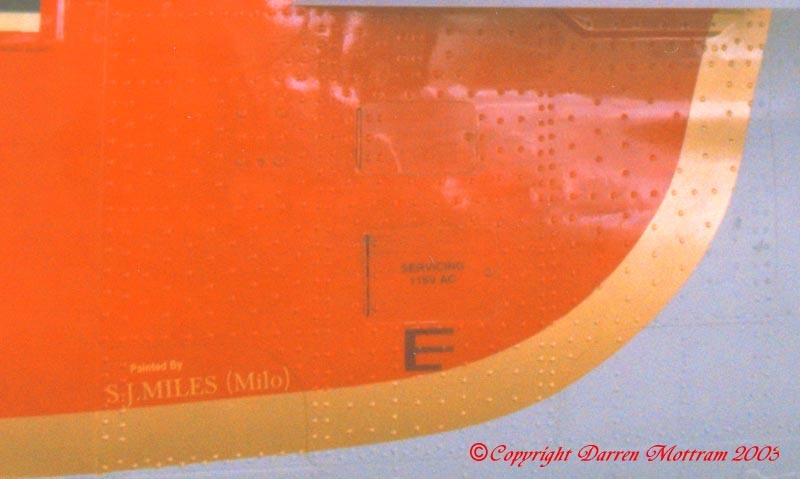 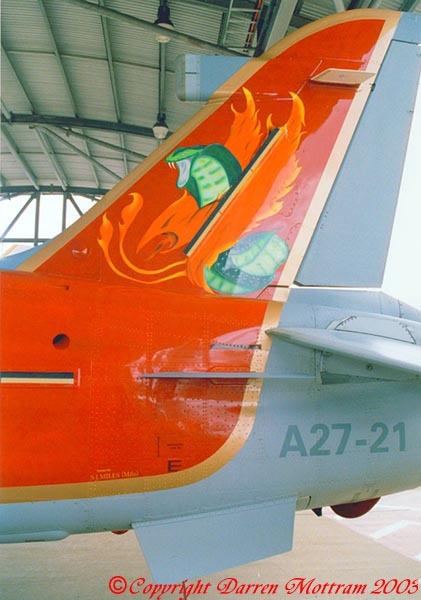 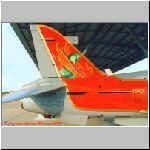 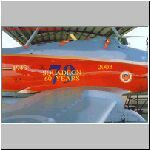 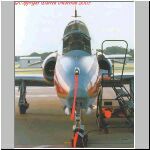 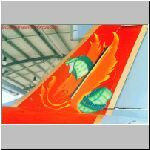 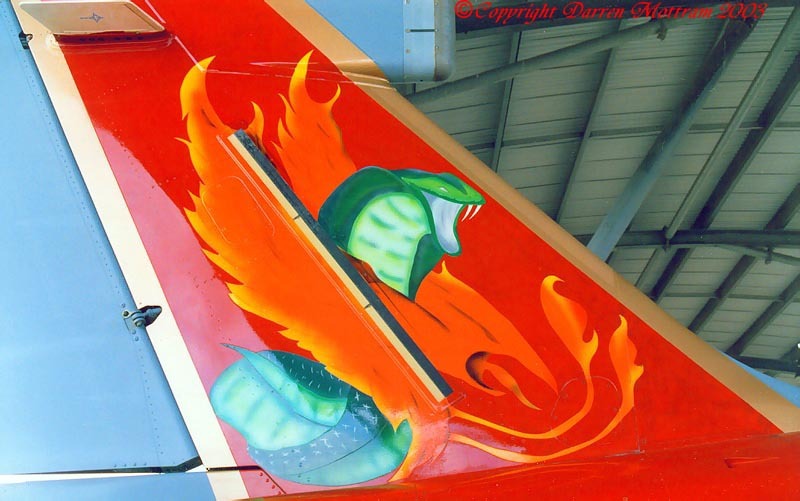 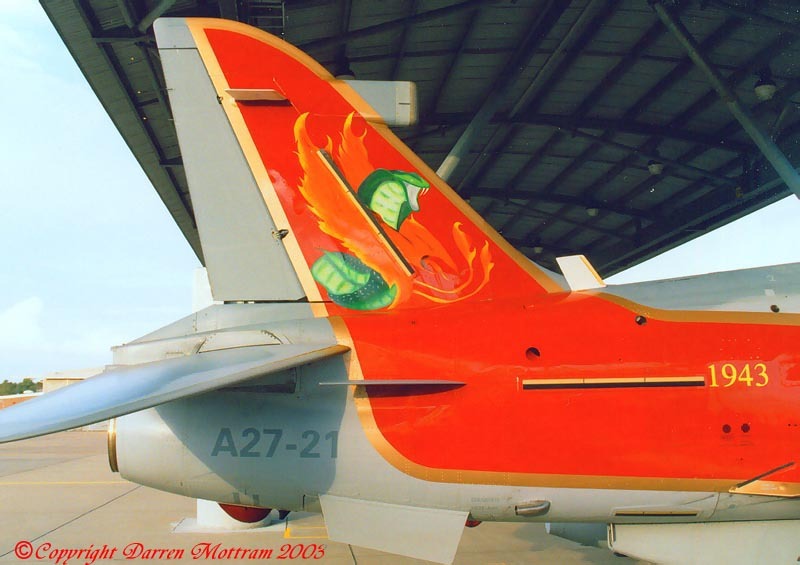 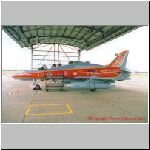 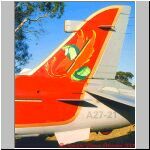 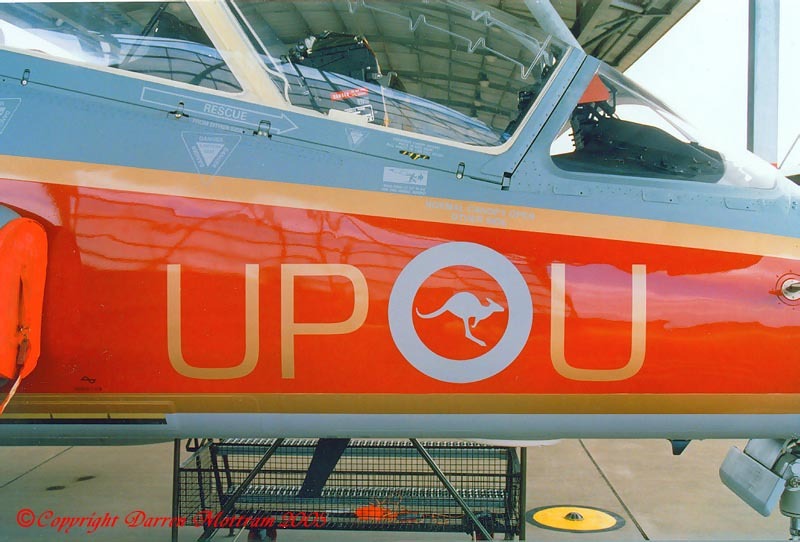 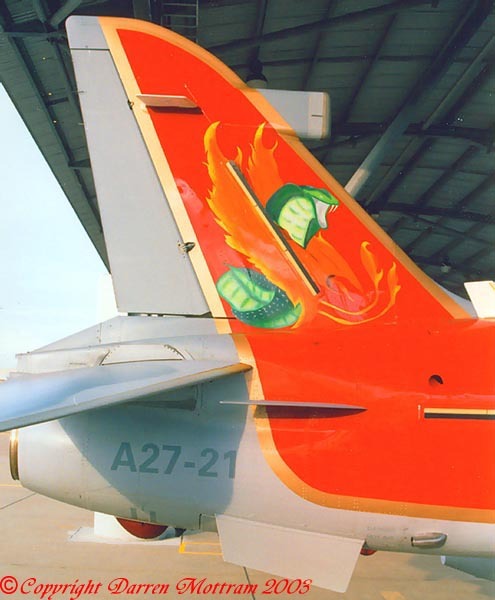 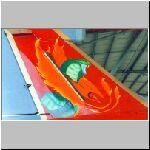 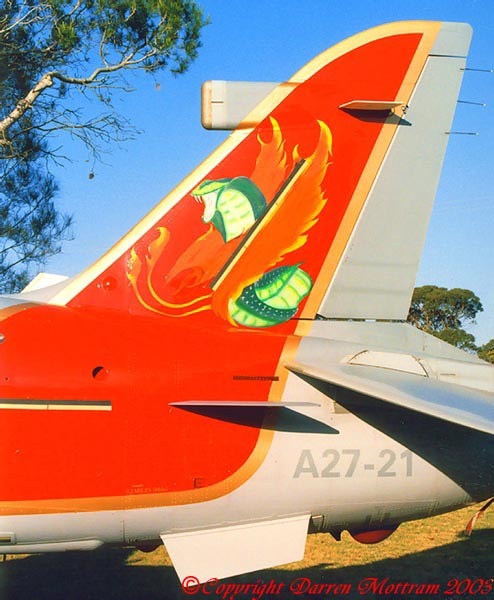 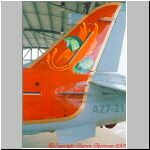 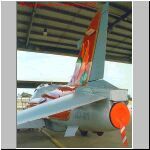 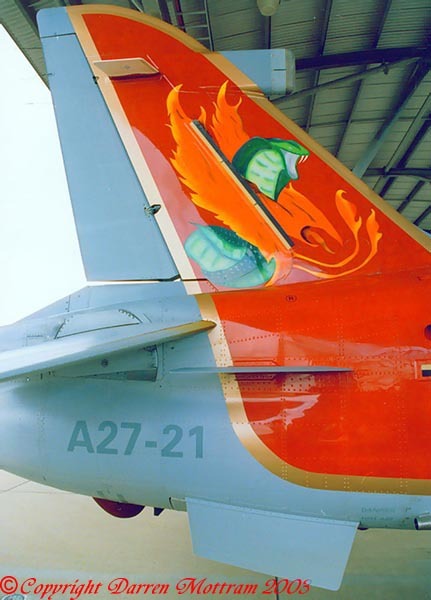 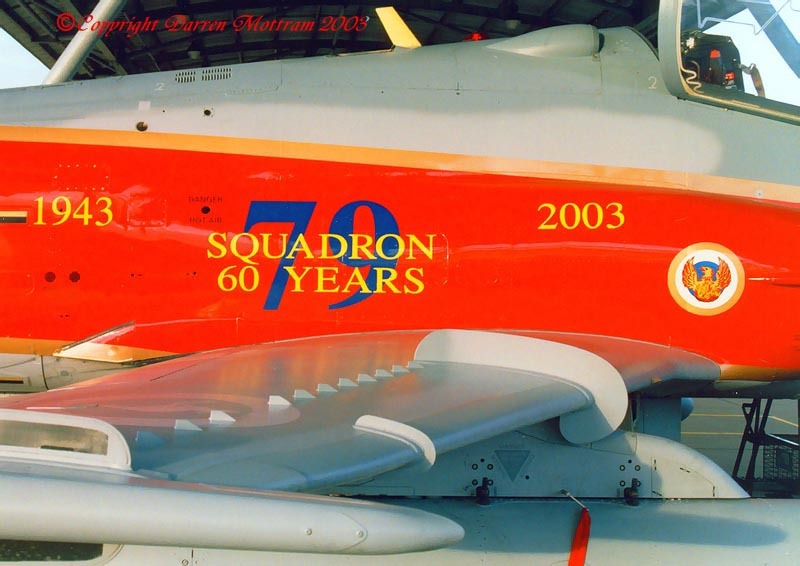 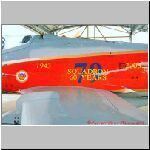 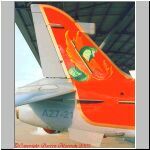 The tail marking represents a stylized Phoenix and Cobra, both of which have been used by the unit on it's aircraft over the years. 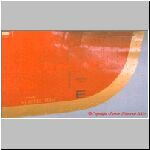 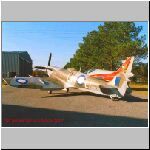 And the codes on the forward fuselage represent those which were worn on the Commanding Officer's Spitfire during the Second World War (79's sqn code was "UP"). 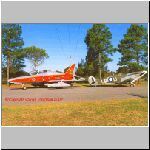 Being based at Pearce in Western Australia (several thousand Kilometres away) I was resigned to never getting to see this one in the flesh. 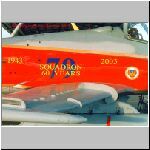 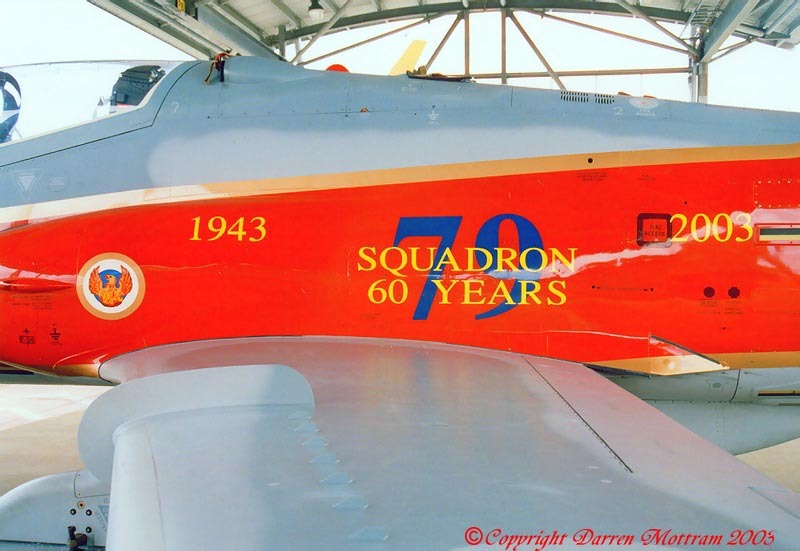 But 79 Squadron recently took this aircraft on a "tour" to show it off and also to highlight the anniversary to those who may not have been aware of the occasion. 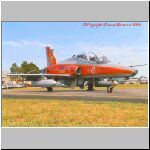 Luckily Williamtown was on the list of stop-overs and I was finally able to get the opportunity to see and photograph this little known and rarely seen scheme during it's arrival, departure and a dedicated photo shoot (very lucky). 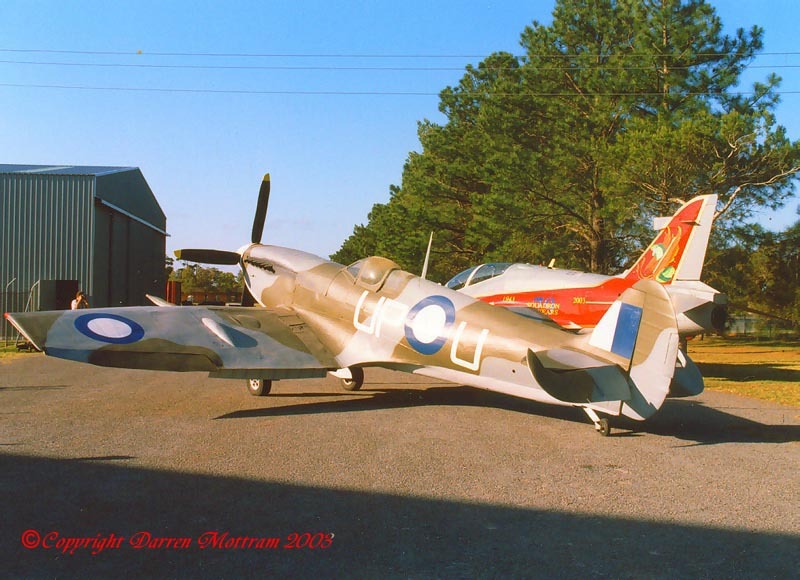 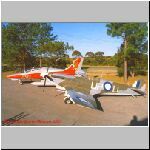 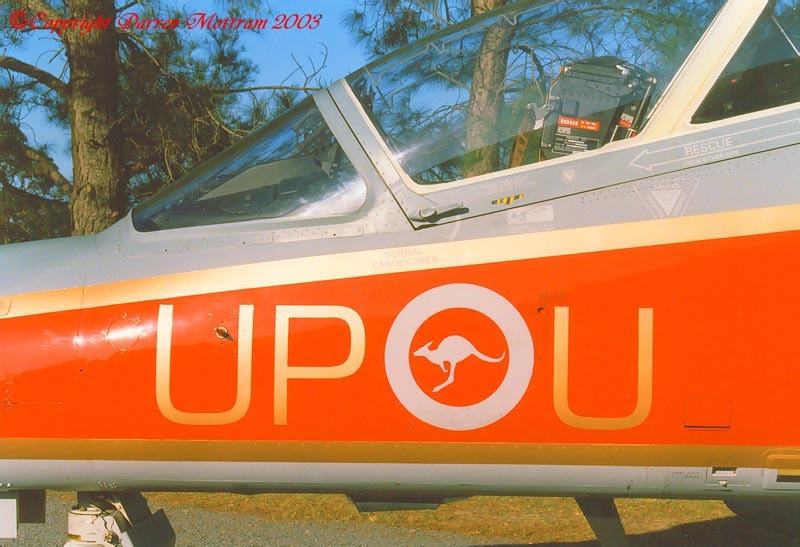 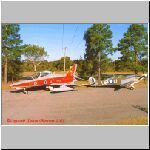 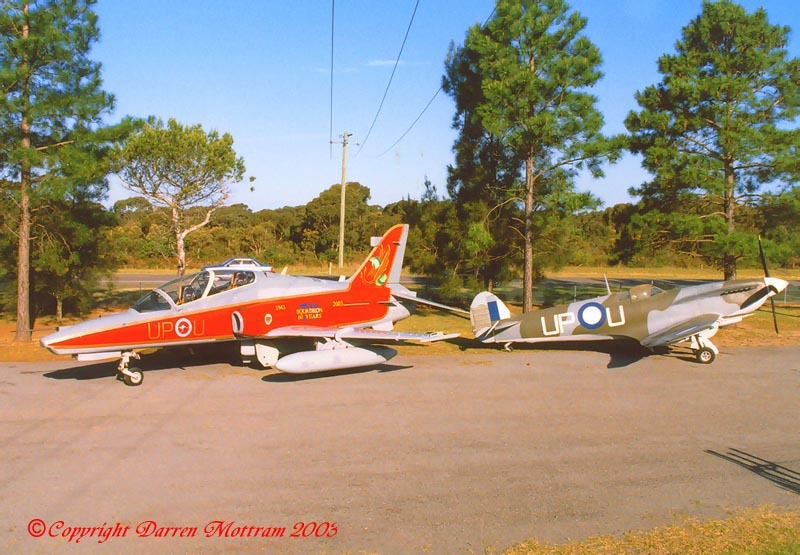 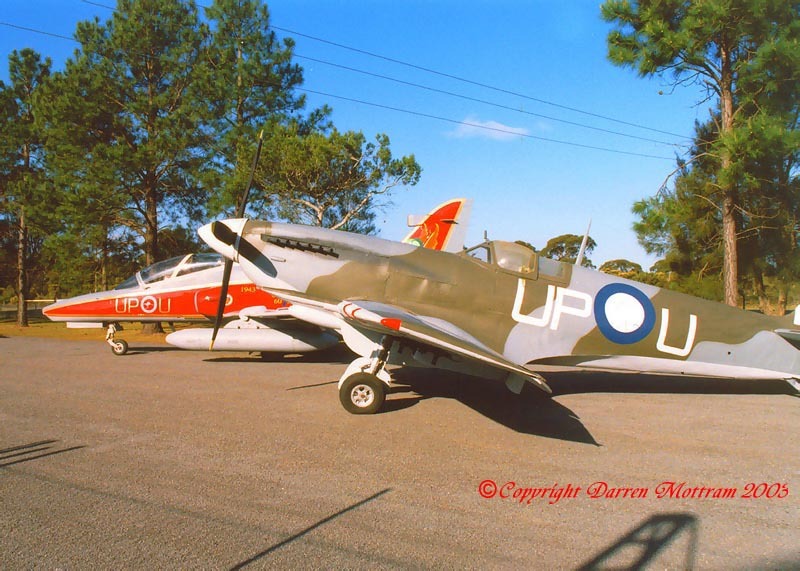 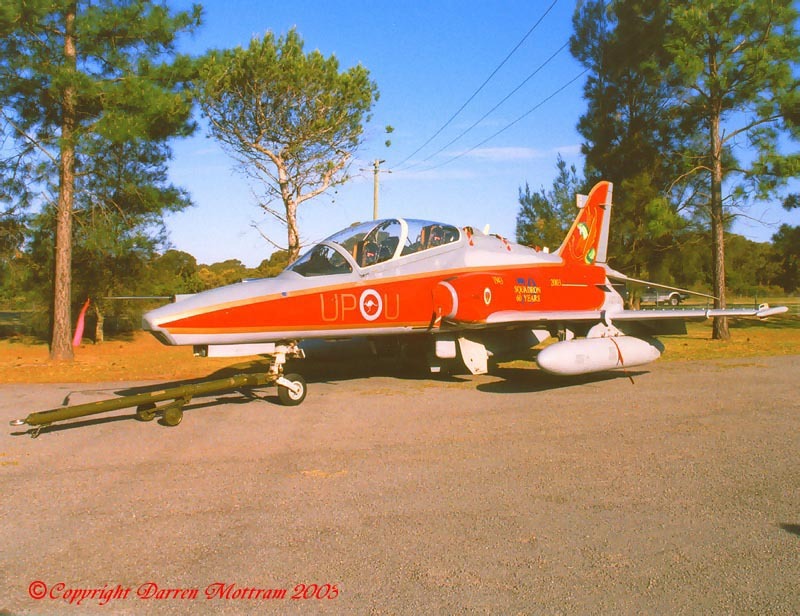 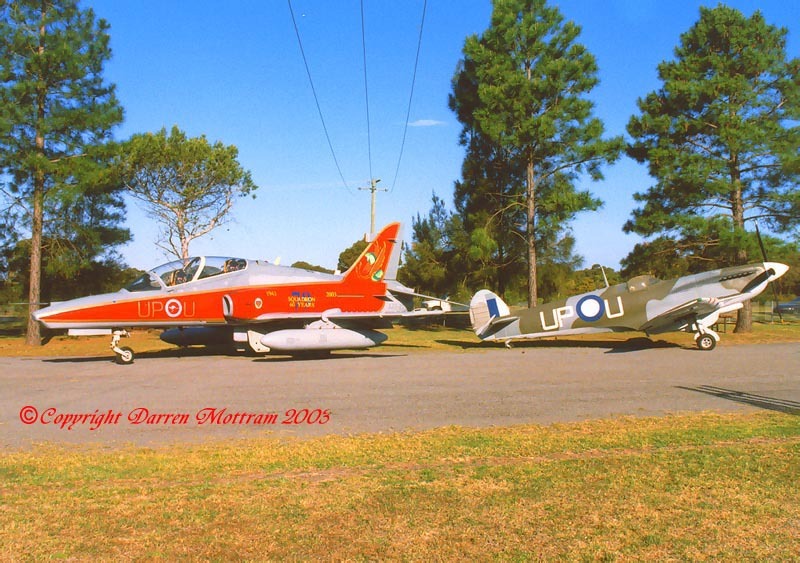 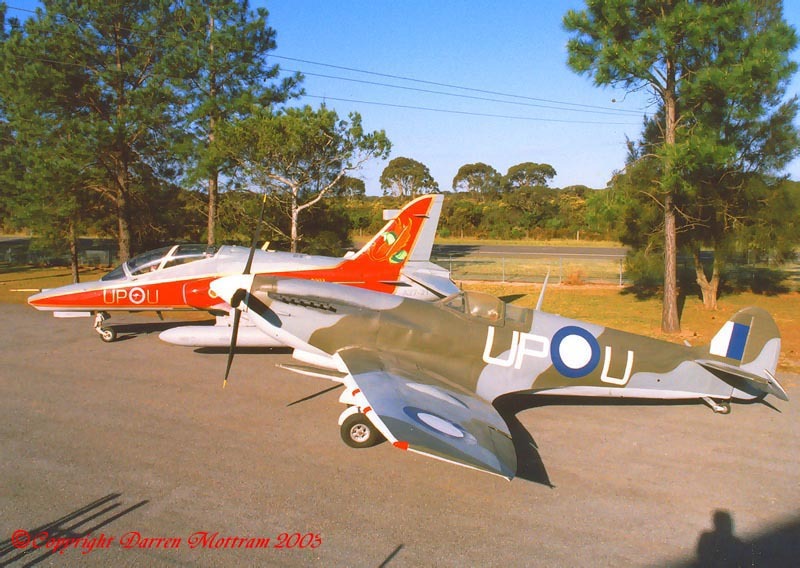 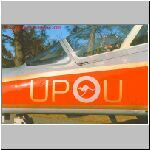 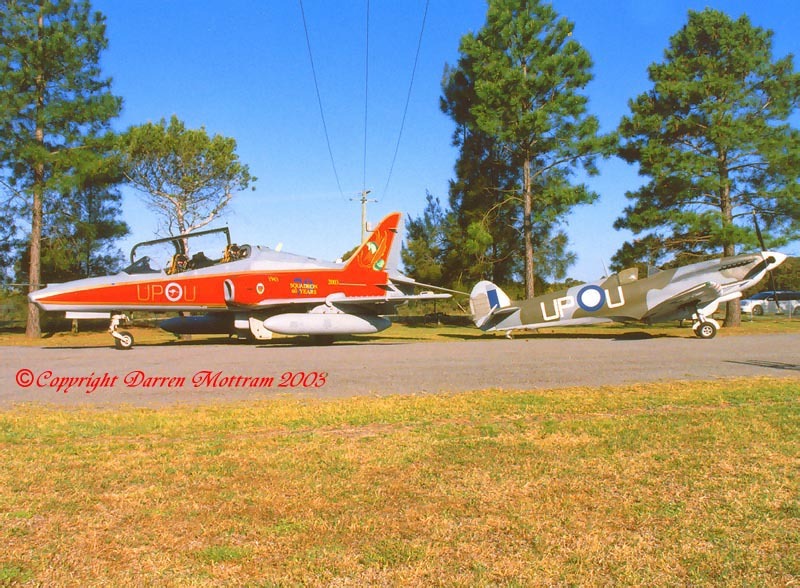 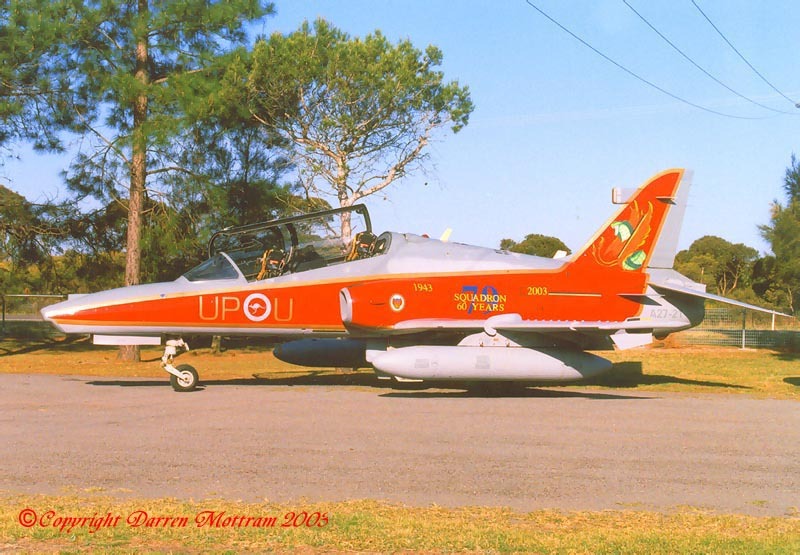 Also at Williamtown is a local museum called Fighter World where there is a fibreglass replica Spitfire which also happens to be painted in the colours of 79 Sqn's WWII Commanding Officer and which bears the same codes of "UP-U" as those worn on the commemorative Hawk. 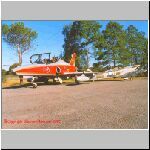 The chance to photograph these two machines together was just to good to pass up, so arrangements were made to tow the Hawk to the museum and capture some unique images. 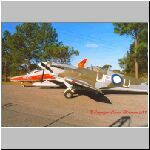 I was fortunate enough to be able to get in on this photo shoot too and have included the resulting images here. 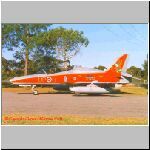 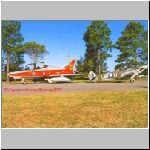 I tried to document this unique jet as best I could and I hope that the photos will be of interest and use to modellers and enthusiast alike. 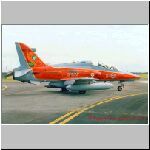 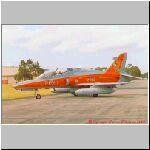 They should also be a good reference for those who purchase the Model Alliance International Commonwealth Hawks decal sheet which includes this scheme. 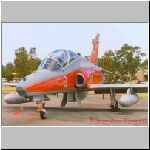 I would like to express my deepest gratitude to the members of 76 and 79 Squadrons, Royal Australian Air Force (RAAF) and BAE SYSTEMS for giving me the permission and opportunity to be able to share this information with you all. 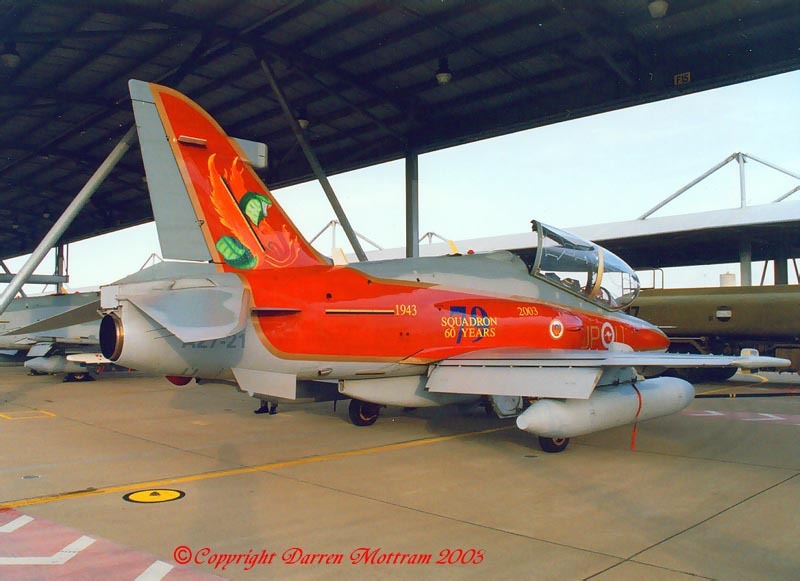 Note that 79 Sqn repeats the aircraft's "last two" from the serial number on the tip of the nose whereas 76 Sqn has them on the nose gear doors. 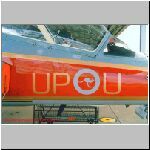 The code letters read "UP-U" on both sides (which has drawn much comment from those who aren't aware of their true origin. 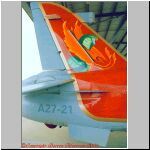 ;-) ). 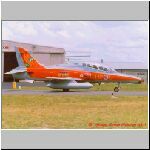 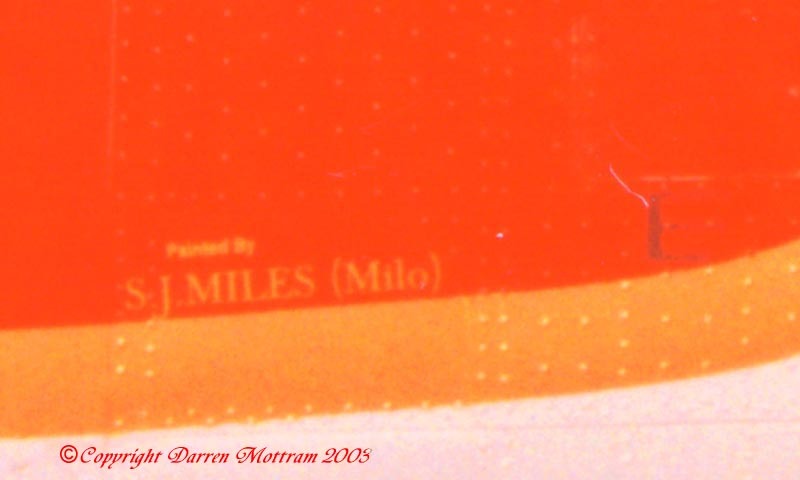 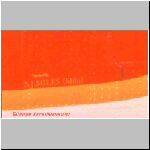 All the high viz colours are high gloss but the original colours remain satin to matt. 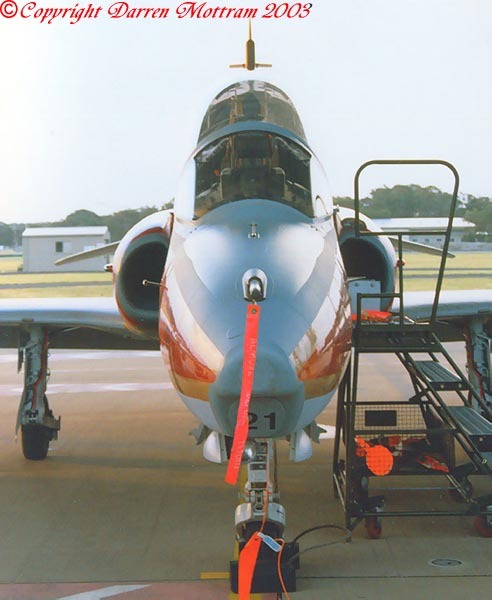 Especially note the differences in reflective qualities of the grey around the nose. 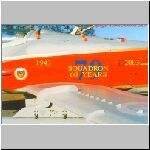 My thanks to the members of 76 Squadron and the crews from 79 Squadron for allowing me the opportunity to take these photos. 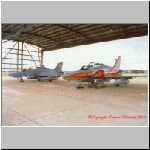 My thanks to the guys at Fighter World for giving me the opportunity to get these unique shots.